With qTest Launch, agile teams can centrally manage test automation scripts across disparate tools, as well as schedule, kick off and report on automated tests across the organization through a single interface. qTest Launch includes out-of-the-box integrations with best-in-class test automation tools and frameworks. A Universal Agent enables integration with any test automation tool — open source, proprietary or custom-built. By centralizing automated test execution and management, qTest Launch enables enterprises to scale test automation and centrally track test schedules and progress across previously disconnected open source tools. Whether you are testing on a local machine, against a virtual machine, or in a dedicated test environment, qTest Launch provides a single location for test machine management. Scheduling test automation across multiple machines is easy with qTest Launch. Kick off tests individually or in bulk, and schedule them on a recurring basis to power continuous testing initiatives. In a development world moving at the speed of DevOps, qTest Launch provides a scalable test automation strategy and maximizes the value of open source tools. Integrate every test automation tool your team is using into qTest Launch for centralized test automation management. qTest Launch includes out-of-the-box integrations for the following tools and enables teams to integrate with any tool via a Universal Agent. Test automation can quickly become separated from business requirements if not properly tracked. 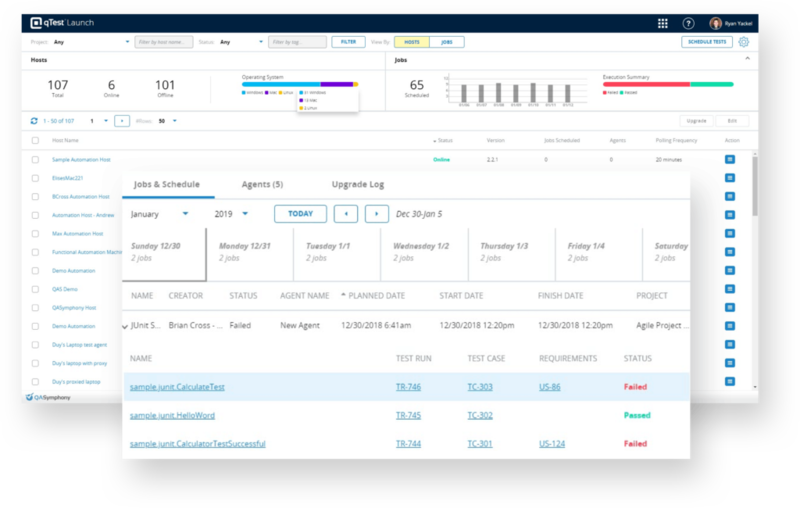 With our real-time integration to ALM tools like Jira, teams can tie automated test results to business requirements to get the full picture of test coverage. Ensure efficient execution of automated testing within and across projects with enterprise-level reporting. Quickly access the latest test automation run results, pinpoint trends and identify additional tests that are good candidates for further automation.